In 2018, the State of the UK Industry Report revealed that for the first time the UK’s health and fitness industry was worth over £5bn and that the number of gyms currently operating was over 7,000. This means that 1 in 7 adults in the UK is a member of a gym. These figures are only set to increase and it’s estimated that fitness and wellness revenue (which includes the health and fitness sector) could exceed £22bn by 2020. With new facilities opening almost daily, emerging trends in technology developing at a rapid pace, and new exercise concepts being pushed to market all the time, it points to one clear conclusion – now is the time to be in the industry. 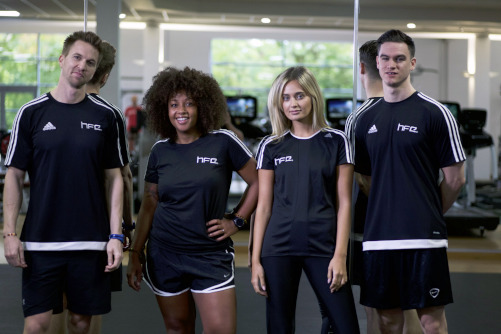 Of all the roles and employment opportunities available in gyms and health clubs in the UK, there’s one that stands above the rest in terms of mainstream popularity and earning potential and it’s that of a personal trainer. For many, PTs are billed as the cornerstone of the industry, the fitness elite. It’s a label that’s not been given lightly as day in, day out, trainers are able to get inside clients’ heads and be the driving force for life-changing results. Once a luxury for the rich and famous, personal training is now available for everyone. Whether in a boutique studio, commercial gym or online, if you want to access the services of a personal trainer, you can. Despite a personal trainer’s potential to help clients change their lives and the 1000s if not millions of PT success stories that exist, there are still many myths and negative stereotypes about the role. The most persistent (and perhaps most untrue) of them all is that trainers don’t actually do a lot. As with any job in any industry, you’re going to get the good, bad and everything in-between. However, the idea that all personal trainers do is stand next to clients when they’re on a treadmill, occasionally consulting notes on a clipboard or iPad while muttering words of encouragement is just false. Similarly, the nutritional advice they give out is far more helpful and effective than simply ‘eat your vegetables, drink water and find a good source of protein’. These dangerous myths (and much more) have recently been addressed by the founder of lea personal training company Ultimate Performance, Nick Mitchell, in his Industry Influencers interview. When it comes to what a personal trainer actually does, the short answer is that they usually work one-to-one with clients, but it’s not uncommon to work with small groups as well. PTs have a range of responsibilities and they include: tracking and recording the progress of clients; creating meal plans and giving functional nutrition advice; designing effective exercise programmes; coaching safe and correct exercise techniques; and assisting clients with setting realistic and achievable short, medium and long-term goals. It’s one thing to enjoy occasional exercise and healthy eating, but it’s something else entirely to have an unwavering passion for the industry and a burning desire to help people. These core philosophies are ingrained in the best personal trainers. That’s not to say that PTs never let their hair down or have a cheat day every once in a while, they are human like the rest of us after all. However, trainers are role models and ambassadors for the industry. This means that they train themselves to stay fit, they eat right, they’re constantly educating themselves and their motivation never dips, even in the face of cold and dark 6am starts and 9pm finishes. Great communication skills, being highly organised, committed and energetic are also must-haves. With all these things in a place, a trainer is in the perfect frame of mind to excel. For more interviews and expert advice from industry’s best and most successful trainers including Matt Roberts, Sarah Scott, Ben Coomber, Shaun Stafford, Tehillah McGuinness, James Crossley, David Kingsbury, Matt Miller, our Industry Influencers interviews are a must-read. For newcomers to the fitness industry, the first port of call is the Level 2 Gym Instructor course. While it’s a standalone qualification, the gym instructor course is also an entry-requirement for Level 3 Personal Training. It’s here where fitness professionals test their mettle by learning how to effectively work with clients, design exercise programmes, deliver nutrition advice, master flexibility concepts, and much more. The best trainers don’t rest on their laurels however after achieving Level 3 status and they constantly look for ways to upskill and advance with CPD. Ultimately, the more knowledge and experience a trainer gains the more clients they are able to help. A few popular progression routes and CPD options include: pre and postnatal, older adults, exercise for disabled clients, sports massage, GP referral, low back pain and obesity and diabetes. Personal trainers can usually be placed into two categories; employed and self-employed. While it’s by no means for everyone, recent reports suggest that as many as 75% of personal trainers are self-employed. For self-employed trainers, this means being your own boss. It affords a great deal of autonomy to make your own business decisions, control your own finances and creatively design exercise programmes from the ground up. As self-employed/freelance trainers become more and more successful, there’s an opportunity to expand and set up their own personal training business or franchise, and even buy their own facilities. Being in full or part-time employment in personal training does suit many PTs as it provides more stability and security over the self-employed route. Typically, trainers won’t have to worry about paying rent, submitting tax returns or buying equipment. However, a tradeoff may have to be made as trainers are often required to work specific shift patterns and teach group classes, even if they don’t have any clients scheduled for that day. If a fire has been lit inside you and you want to become a personal trainer, we have a sample manual, mock exams and an award-winning blog to give you a true sense of what it takes.